I am not sure whether I ever read fiction by Evelyn Waugh before reading The Loved One: an Anglo-American Tragedy, a short black comedy set in Hollywood and Beverly Hills, California. I may have read Brideshead Revisited before I started keeping a reading log in 1989. I know that I watched the Masterpiece Theater showing of Brideshead Revisited with Jeremy Irons and Anthony Andrews at least twice, and I saw another production a few years ago. It may be my imagination that I read the book, but I know the story well. 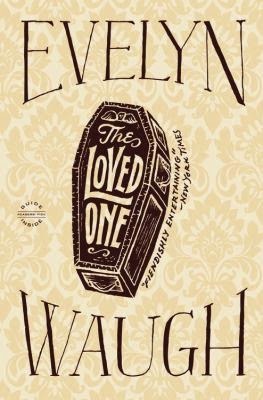 The Loved One is something completely different than Waugh's masterpiece, though it does have a tragic trio of two men and a woman. The woman, funeral makeup artist Aimee Thanatogenos, does not really want to become involved with the protagonist Dennis Barlow but then changes her mind, and it does not end well. Maybe the short book is slightly like Brideshead. The supporting cast is much smaller, though there is a sort of British paternal figure in the character of Sir Ambrose Abercrombie, head of the cricket club, whose membership is British men working in Hollywood. Sir Ambrose demands good behavior of his countrymen, and he is especially disappointed by Barlow. Maybe The Loved One is more like Brideshead than I thought. The similarities definitely end there. The Loved One is short and wickedly comic. Readers will not equate the failures of Dennis Barlow with the disappointments of Charles Ryder and Sebastian Flyte. Or will they? Waugh, Evelyn. The Loved One: an Anglo-American Tragedy. Little Brown, 1948, 2012. 146p. ISBN 9780316216463.